All of us in E. J. Papadopoulos S.A. do not perceive “corporate responsibility” as another term of the modern business jargon. On the contrary, it is translated into every day, unselfconscious and sincere offering. It means to us good deeds whereby we attempt to show our gratitude to the Greek consumers who have adored and trusted us since 1922. We aim to make more and more people smile each and every day. MAKING CHILDREN SMILE Children – the most vulnerable social group – are our future. They have so many different needs that vary from nutrition, education, sports and entertainment to welfare infrastructure and services. We make our own small contribution to building a better tomorrow via supporting a number of organizations and activities and taking initiatives to help children. We always stand by them and we try to cater for their needs in any way we can. Planning and organizing educational school visits to the firm’s plants in Tavros and Thessaloniki. The visits’ purpose is to introduce our little friends to the magic world of biscuits, guide them around the firm’s facilities and show them exactly how biscuits are made, from the processing of the raw materials to the packaging and the storage. 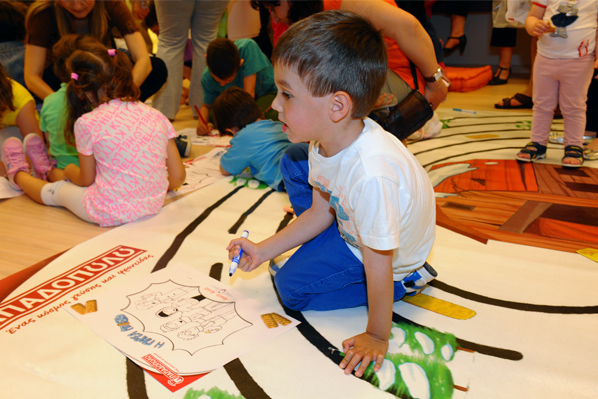 Collaboration with the Hellenic Children’s Museum: for the past 20 years, E.J. Papadopoulos S.A. has been a good friend and a permanent sponsor of the Children’s Museum, aiming to stimulate children’s creativity and imagination, in their own special place inside the museum. The “Kitchen exhibit”, which is sponsored every year by our company, is hosted in the new building where the Hellenic Children’s Museum is located in Athens (part of the Athens Conservatory building). 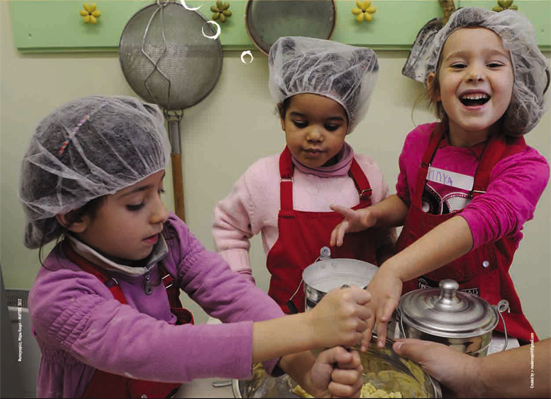 In a specially designed kitchen, kids learn how to prepare and bake biscuits, wearing the aprons and hats and using the traditional recipes and healthy, nutritious materials that are provided to them by our company. According to experts, cooking is an important educational activity because it engages all senses, promotes team spirit and rewards creativity. Support and participation in school events with reference to nutritional matters and the promotion of health education in order to help children understand the value of proper nutrition. Sponsorship of theatrical performances for children. Permanent collaboration with Attica Park: for 20 years, Papadopoulos company has been a regular sponsor of Attica Park. Treating animals and the natural environment with love and respect are values that need to be imparted to kids from a very young age. The visits and the programs organised by Attica Park enable children to increase their environmental awareness and build a strong relationship with the environment. Support of summer camps which are attended by children of large families and vulnerable groups. Support of Greek Scout and Guiding Organizations. E.J. Papadopoulos S.A. is actively involved in the country’s development via acting responsibly, showing respect to people and the environment as well as being sensitive and in the spirit of making all people smile every day. For 2013, our goal through this corporate action called “Smiles”, was not only to pursue our existing collaborations but also to go beyond that; to strengthen our activities, help even more people in need… and “hand out” plenty of SMILES! Corporate Responsibility is not another condition for us in the terminology of modern business. Instead it means offering, which is honest and made on an every-day basis. The notion of responsibility to the community has always been a basic principle of our company’s business operation. With the same responsibility and respect for our history, while working in a complex social, economic and political environment, we continue our efforts responsibly, responding to the needs and expectations of our social stakeholders, in the form of organized Corporate Responsibility, enhancing our social and environmental role. Our company’s vision is to produce and offer products of ever higher quality and taste, always responding to the needs of people for a balanced and tasty diet. With our faith in our vision as our strength and guidance, we promote social behavior patterns and encourage initiatives that contribute to creating better conditions for society and the environment. Every day we take responsibility for providing you with products of high quality and taste. Every day we take initiatives that contribute to the spread of the education of children in the value of balanced nutrition. We are trying to reward society with the positive dividend that we are attributed to us as a continuation of love and confidence that has been shown to us for a century. These are the reasons why we have strengthened and broadened our Corporate Responsibility strategy by designing and implementing actions for each of the pillars we work on: Employees, Society, the Environment and the Market. We are all proud that all these years we are doing our duty with sensitivity, consistency and dedication. For us, social well-being is interdependent with responsible economic growth. This principle was embraced by the founders of our company, this principle is served by the third generation of the company’s management, to this principle all those who work in our company believe in. We look forward to tomorrow with optimism and the knowledge that we remain a responsible corporate citizen, with a practical contribution to humans, society and the environment, just as our tradition implies. To inform students and teachers who visit our three factories in Athens, Thessaloniki and Volos, about how significant is for a kid to have well-balanced daily meals, starting from the most important one: breakfast. To help kids learn what are the healthy nutritional ingredients that should be part of their breakfast. To offer our Company’s products, which are most suitable for breakfast, to children and families in need for free. Municipal Foundation “Saint Stylianos”, the orphanage in Volos, “White Butterflies”, Social Markets and many more associations.